We recommend downloading and installing the new OS even though you might experience some problems getting everything back to normal. The update is packed with lot’s of new features including those new EX-USB-PCM sounds that everyone has been waiting for and includes new Acoustic Pianos, Brass and Woodwinds. We have also read that “some” M3 owners have had some real headaches with the update which are still being worked on at this point, but most M3 users have had little or no problems with the new OS. After updating to 2.0, the first thing you might have noticed is that all the programs are now in a different order. The sounds are set up more like the “Producers PCG” that Korg provided when they released their super charged 512 patch update a few weeks ago and the programs are now all set up in sounds categories. This creates problems with any custom combis that you have created since the combis all reference the programs that were in their old positions. Unfortunately, the only thing you can do to fix that is to go in and change all the programs to point to the new positions in the 2.0 OS. A second problem is with the drum patterns and also has to do with the change of position in the programs. What you will notice with the drums is that all the drum track programs default to the A018 – Studio Standard Kit. This problem only occurs in program mode. Also, the only fix for this at the moment is to go in and change them back one by one to your old drum kit settings. Proto Rock, our custom sound set for the M3 has been virtually unaffected by the update. You will not experience any “broken combis” that others might experience due to the programs being moved around. PR’s programs are all original programs that we have programmed so the combis reference those and not the factory programs. All of Proto Rock’s data is neatly self contained in one soundbank and does not rely on the factory settings. We had taken great care to set things up like this just in case of a situation like this. We have learned it’s better to have everything living in one bank and not to rely on factory settings being where they are supposed to be. After a synth is around for awhile, data gets moving around and that’s when you start running into problems. However, there has been one small problem with the drum programs that has occurred with the Radias programs in User-F bank. Since those programs were referencing the factory drum settings all the drum track programs default to the A018 – Studio Standard Kit (as I mentioned above). We originally did this so we could provide some free demos of the sounds and it had to be set up that way, but we were well aware of potential problems that might occur if things were moved around. In any case, we have now fixed the problems with the Radias drum patterns and have updated Proto Rock to version 1.4.6. This version is fully compatible with the new M3 2.0 OS. This is a free update for anyone already running Proto Rock 1.4 or later so just contact us via phone or e-mail for the free update. Just beware not to load this version into your M3 until you have first updated to the new 2.0 OS since it is not compatible with earlier operating systems. Also note that if your running our “original” version of Proto Rock (version 1.0 through 1.1.5) there is no need to do anything since the update only affects the Radias programs. Just reload the Proto Rock data after you upgrade and your ready to roll. If you have any questions or comments about the new Expanded M3 or Proto Rock, please contact us. 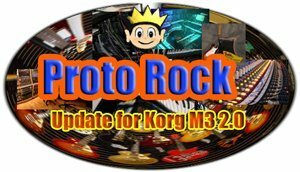 More info on Proto Rock and all our Korg M3 patches can be found at the Korg section of our web site. Thanks for your support and enjoy the sounds. don’t remember what version proto rock, I have. What do I need to do now? Your running 1.4.5. I’ll send the update right over.